Is This What Passes For An Outsider In Sussex County? 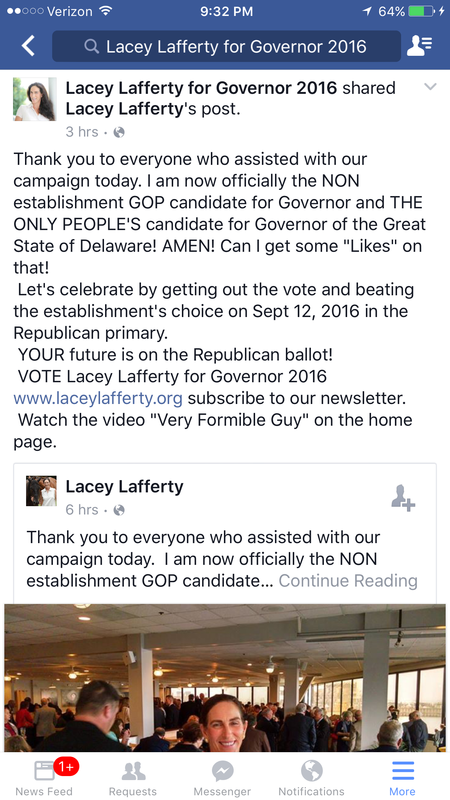 Following her failure to receive the endorsement at the Delaware State GOP Convention, as a candidate for Governor, Lacey Lafferty posted this on her Facebook page. It seems as though Ms. Lafferty is trying to spin the fact she failed to garner enough votes to receive the endorsement. But can she really be the “non-establishment” candidate? Considering this? How can you be a member of the Republican Party machine, and not be a part of the establishment? Is this just her attempt to play the “Trump” card, to be an outsider. So which is it? Is she a part of the party machine, an insider? 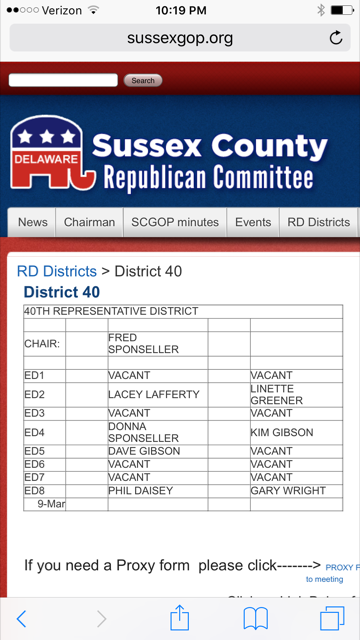 Or has she been using the position within the party for her own benefit, and cares nothing about the people she should be representing as an ED within the Sussex County GOP? This has the smell of corruption to me, and calls further into question her qualifications for any elected office, let alone the highest in the state. 16 Comments on "Is This What Passes For An Outsider In Sussex County?" don’t you have to live in the district you are an ED in ? CJ, no. You can be placed as a temporary ED, as long as there is no one actually from that ED who wants to be an ED. of course there is no definition of temporary I bet. Until challenged by someone in the district. But if there is another empty slot they can simply be moved there. It doesn’t matter, the DEGOP will continue to be irrelevant statewide. The GOP doesn’t offer anything like good competent effective governance. Instead it’s about dogma and paranoid on guns, fear, e-bola, bathrooms, abortion, racial resentment, illegals and mostly sexual issues. It’s quite sad because the incompetent hubris of single party rule is quite obvious here without any viable alternative. The sheriff is getting nearer lol. ED 4 Kim Gibson and ED 5 Dave Gibson are husband/wife. Frank does the wanna be candidate scare you that she really is getting public support? 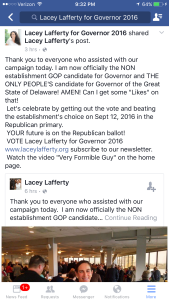 Sorry Henry, the majority of people in Sussex County do not participate in your delusions about Lacey Lafferty having any chance whatsoever of winning the primary let alone Governor!. now she trying to copy trumps “non – establishment” appeal. Ain’t gonna work for ya honey. I can’t wait until this election season is over so I can stop seeing the delusional Lacey Lafferty crowd run around talking like Lacey has a chance, After this is over can you please choose someone to follow who can speak with intelligence!! Pretty please? And let’s not have Lacey running over and over again for elected office like Rose Izzo or whatever her name is. This is becoming an embarrassment to my gender. There has to be women out there with the resume and skills to run for office. Why can’t the Republican party seek out these women? It’s because the GOP is hidebound, inept, aging, male-dominated and just plain stupid — just like this blog. One would think you all have a fetish for the wanna be candidate as much as you keep bringing her up. Young boys would say, “I hate girls” when in fact they like girls. Could you all have a crush? Furthermore reliable source said that Colin Bonini was a delegate at the convention therefore voted for himself. 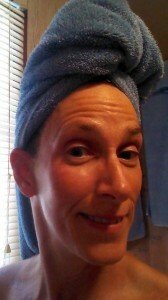 Frank really you don’t have a topic other than a pretty wanna be candidate that has her head wrapped in a towel. 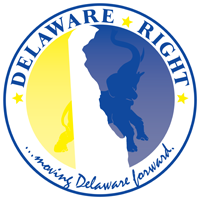 ← Delaware State GOP Convention, YAWN!